Tom Daley wouldn’t stand for these conditions! We had, by now an exhaustive list of local pools of which there are many but they all only seem to open for one month of the year. 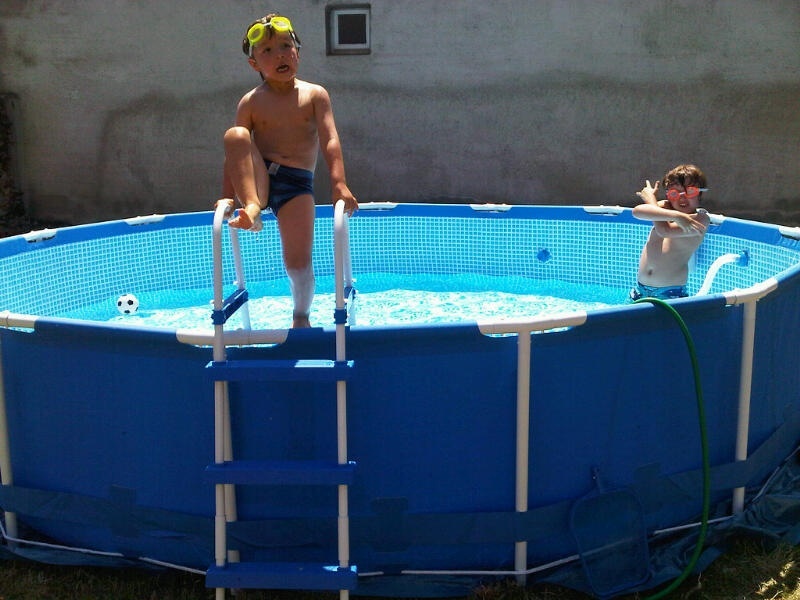 When we first bought the house and had no hot water I had the genius idea of going to a swimming pool where we would be able to shower/swim/shower (any other combo would have resulted in us getting thrown out for environmental reasons). And so we spent days in our early first visit on a crazy wild pool chase – finding one on the Internet, driving for miles…. Finding it closed. We finally googled an indoor one in Lourdes where I hoped I could bathe in holy water and come out a size 8 but when we arrived at it – it was the one day of the week it closed. So much for spiritual enlightenment. 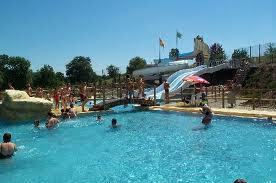 Even our little local French villages have amazing outdoor pools but they reserve opening for July and August only. I have no idea how the business model on this works but there is clearly little economic sense in opening before then. We did eventually find one brilliant outdoor leisure complex in Mirande – only twenty minutes drive away which opens in June. A combination of three pools, slides, table tennis tables, sunloungers and snack bar – we thought we’d hit the jackpot one June half term when we discovered it open. As we paid our entry fee though, the lady behind the counter eyed us suspiciously – “les anglais?” She posed. “Oui” we said excitedly. “Ah” she said as if that explained it all. We were the ONLY people in there. It was warm and sunny outside but not boiling and as soon as our pasty, white, english flesh hit the water we understood why we were solitary bathers. It was FREEZING. As with most french outdoor pools, there is no heating. So if you happen to be there at the beginning of the season when the water has had little sunshine on it – you may as well be in that bit at the end of Skyfall when Bond tussles under the ice with a bad guy. Obviously so as not to lose face we carried on regardless. The kids feel no cold anyway and were thrilled to have the slides to themselves and I shivered in the shallow end praying for it to be over. 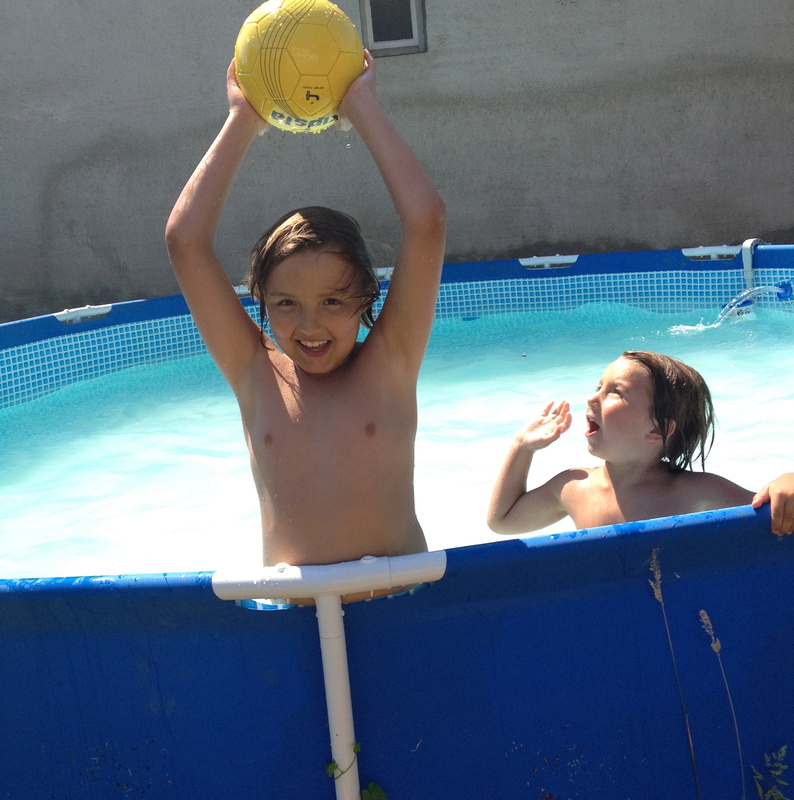 Once it IS July or August though there are loads of great local pools to visit in Marciac, Vic-en-Biggore or Plaisance. 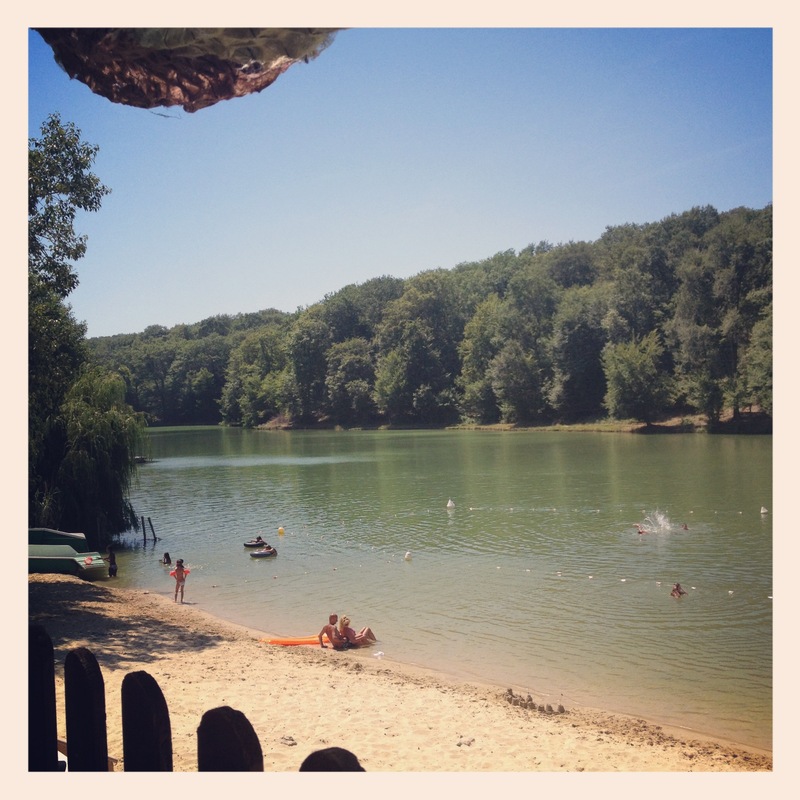 And best of all in years to come we discover the Lake at Aignan which is a man made beach next to a gorgeous green tinged lake. Aignan and on and on…. With slides and a rope park with zip wires and dangerous climbing feats to attempt. The kids love it. And we love the amazing restaurant there with prawns the size of small aliens you can crack out of their shells and get covered in prawny juice but not care cos you are in a damp swimsuit anyway! Best way to eat seafood. Which makes sense really – perhaps that WAS the original purpose of the bikini – to eat seafood without spoiling your clothes! Breton cover up you say? 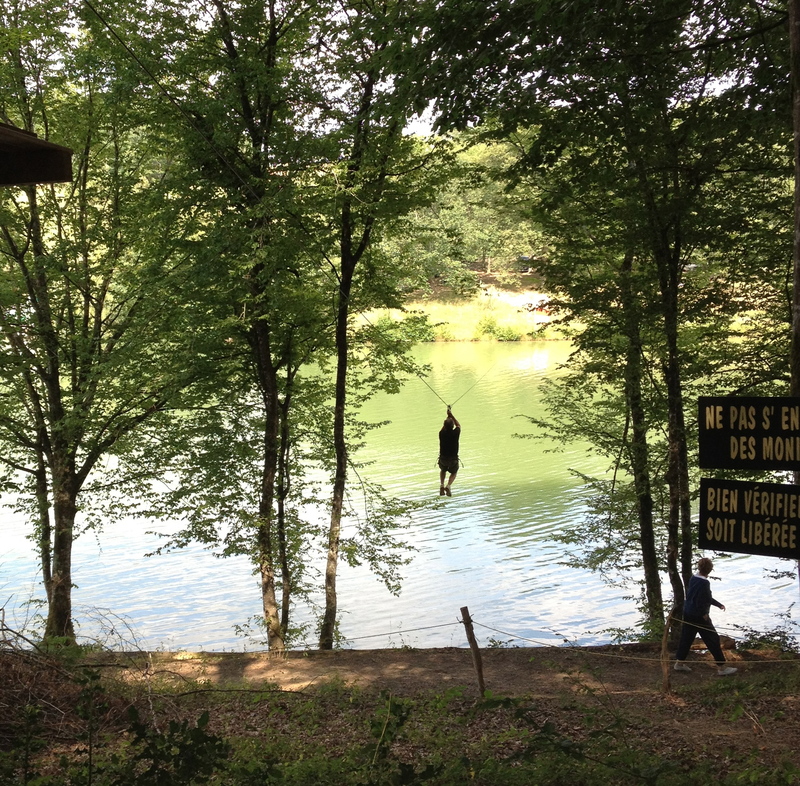 Of course the easiest way to do some swimming in rural SW France is to build a pool. And this of would have been Peter’s preferred option. In fact he had plans to do this before we even had a kitchen or a bathroom but good sense prevailed – in other words I told him not to be so ridiculous. The truth is, if we did build a pool we could rent our lovely holiday home out for others to enjoy and charge more and find it easier to rent. And readers – I hope in the not too distant – real life we will be doing this, but you’re still a couple of years behind when we had not the finances or the time to do this. 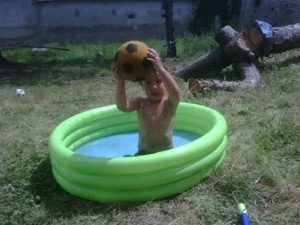 So instead we bought an INTEX pool which takes days to fill, is freezing cold at first and which Rebecca Adlington may find restrictive in terms of Olympic length swimming, but for our two boys it was ideal. At 15ft across there is plenty of room for them to swim about and for peter to float in a lilo with a bottle of beer in hand at around the 5pm mark. We have none of us worked out yet how to take chips n dips in there with us – but if we did it would be just about perfect. This entry was posted in Uncategorized and tagged aignan, intex pools, lac d'aignan, marciac pool, Mirande, Swimming pools Gers by vicawhite. Bookmark the permalink. I can’t wait to take a dip!